Do you have ever heard about “thirikadugam” its a combination of sukku (dryginger), milagu (pepper) and thippili(long pepper)!its a handy medicine that will always lie readily powdered at my patti’s kitchen pantry shelf.As its a great treatment for sore throat and cold with grandchildren’s always around her all the time. she always insists my mum to give it to keep cold at bay.This thirikadugam can be mixed with hot milk or even can be taken after boiling it with water.Thippili by itself is a great cold reliever! it has a very sharp peppery taste.In one of the herbal remedy books I read about this thippili rasam recipe and tried it in my own ways changing some ingredients!it came out very well.Generally for all rasams a hint of jaggery should be added as for as am concerned because adding only lifts the taste and flavour but its always optional.Don’t add too much thippili add only as mentioned because it has very intense flavour by itself.This rasam need not be boiled!when white foam starts it can be switched off.Its an excellent therapeutic rasam with rich healthy goodness. 1.First keep ready with all the ingredients listed. 2.Now add oil in a kadai and fry all the” to roast and grind” ingredients. 3.First add dhal when colour changes add coriander,garlic followed by other ingredients in the list. 4.When cool grind to a powder and keep ready. 5.In a kadai add ghee make mustard to splutter then add urad dhal followed by some squeezed tomatoes. 6.Add salt and jaggery and cook till tomatoes turn tender. 7.Now pour in the extract(check for tanginess and correct it as needed). 8.Add ground powder and turmeric powder to it.When white foam forms(don’t let it boil) switch off and add some chopped coriander and serve. First keep ready with all the ingredients listed. Now add oil in a kadai and fry all the" to roast and grind" ingredients. First add dhal when colour changes add coriander,garlic followed by other ingredients in the list. When cool grind to a powder and keep ready. In a kadai add ghee make mustard to splutter then add urad dhal followed by some squeezed tomatoes. Add salt and jaggery and cook till tomatoes turn tender. Now pour in the extract(check for tanginess and correct it as needed). Add ground powder and turmeric powder to it. When white foam forms(don't let it boil) switch off and add some chopped coriander and serve. Don't let the rasam boil it will not taste good. While dry roasting dhal should be added first so that it becomes golden and nice aroma is released. I have used rock salt. You can make this powder in advance but in that case dry-roast them without oil. Thipili is totally new to me but I’m always in for any rasam..lovely share!! 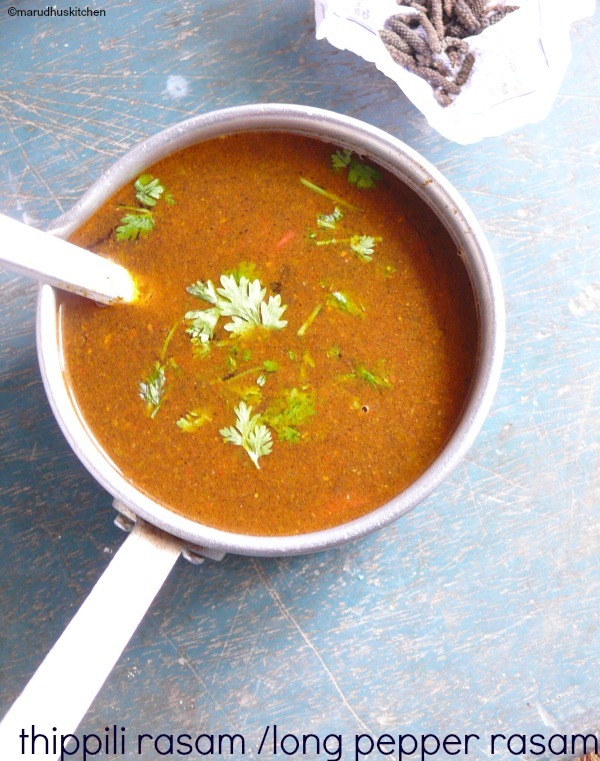 Healthy and yummy rasam!! Anytime comforting meal!! 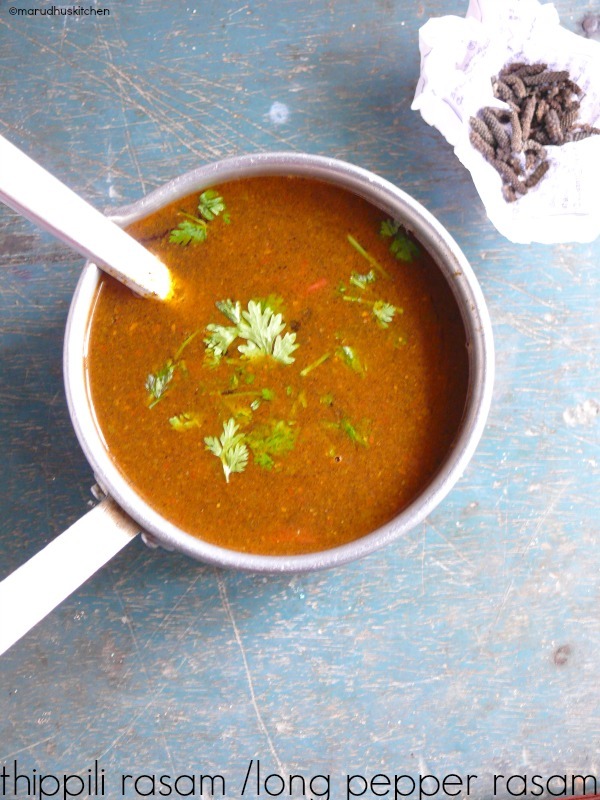 I need to try to get this pepper, looks delicious yummy rasam. Never heard of this rasam before, but looks so intriguing. Lovely share, Vani.